Born September 26, 1914, on his father’s homestead farm near Braddock, North Dakota, Alfred O. Hanson was the son of Norwegian immigrant parents. He recalled that, as a boy, he had collected buffalo bones on the farm and had observed circles of stones which secured Sioux teepees. He married Elizabeth Marie Miller on May 16, 1942, in Columbia, Missouri. He is survived by his wife and their four children: Andrew Jorgen Hanson of Bloomington, Indiana; Donald Farness Hanson of Minneapolis, Minnesota; Ardith Hanson Field of Colorado Springs, Colorado; and Craig Demorest Hanson of Rochester, New York; and by four grandchildren. Professor Hanson received his elementary education in a one-room country school in Emmons County, North Dakota. After his family moved to Grand Forks, North Dakota, in the mid-1920s, he attended high school and college there, earning a BS in education at the University of North Dakota in 1936. He was a high school science teacher in Pine River, Minnesota, in 1936–37, but returned to the University of North Dakota as a teaching assistant in mathematics, obtaining an MA in 1938. He then enrolled at the University of Wisconsin-Madison as a graduate student in physics. In 1942, he received his PhD in physics under the direction of R.G. 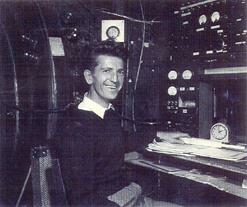 Herb and remained at the University of Wisconsin van de Graaff generator laboratory as an employee of the Manhattan Project until April 1943, when the two Wisconsin van de Graaff generators—and most of the staff working with them—were moved to Los Alamos, New Mexico, to continue the neutron measurements needed in design of the atomic bomb. On July 16, 1945, Hanson was in charge of a small ground experiment at the New Mexico Trinity-North site, 10,000 yards from ground zero, when the first atomic bomb test shot was detonated. In January 1946, with his wife and young son, Andrew, he moved from Los Alamos to the University of Illinois as an assistant professor of physics to begin his long and distinguished career in academic experimental nuclear physics. At that time, Donald Kerst’s 20-MeV betatron at the University of Illinois produced the highest energy x-rays in the world, and Professor Hanson, with colleagues, used them to investigate the structure of, and especially the size of, atomic nuclei. In 1948, Professor Hanson was joined by E. M. Lyman and M.B. Scott in a seminal electron scattering experiment, which was celebrated 35 years later by a commemorative conference held in Urbana. By 1950, a much larger betatron, capable of producing 300-MeV electrons and x-rays, had been constructed at Illinois. In a sense, the earlier betatron was used to investigate how atomic nuclei are constructed from protons and neutrons, while the larger machine was used to study the structure of the protons and neutrons themselves. Using this new capability, Professor Hanson’s group performed a series of elegant experiments that laid the path for others to follow. In 1967, when support for the 300-MeV betatron was being terminated, he began experimental work with a new kind of electron accelerator, a microtron, which, using a superconducting linear accelerator, produced much more intense electron beams. In his career at Illinois, Professor Hanson directed 18 students to their doctoral degrees in physics. In 1955–56, Professor Hanson was a Fulbright Scholar in Turin, Italy, where he assisted in setting up a betatron laboratory there. Again, in 1960, he served as a Fulbright Lecturer—with the betatron group in Sao Paulo, Brazil. Professor Hanson spent a sabbatical at the Brookhaven National Laboratory in 1961–62 and, in 1965, managed a high-energy experiment there. 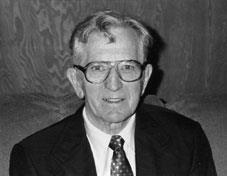 He was a Fellow of the American Physical Society and a member of Sigma Xi. Other activities included service with the National Research Council sub-committee on neutron measurements and standards, 1948–50; committee for the review of nuclear programs of the National Bureau of Standards, chairman 1965; co-chairman, with Peter Axel, of the Gordon Conference on Photonuclear Reactions, 1959. Professor Hanson was a member of the Unitarian-Universalist Church , was active with the Boy Scouts, and enjoyed hiking, canoeing, and camping with his family. In retirement, he joined his wife in several Earthwatch expeditions and in co-stewardship of Tomlinson Pioneer Cemetery Savannah-Prairie Remnant, now a dedicated Illinois State Nature Preserve in Kerr Township of Champaign County.